There’s a distinctive “Up North” feel to the top games of the second week of February. Many of the elite teams in the Northern sections of the state (8AA, 7AA, 7A and 5A) go head-to-head in games that could decide the top seed, but none are as certain to do so as Moorhead’s visit to Brainerd Saturday afternoon. The Spuds (9-8-2) currently have dibs on the top seed in Section 8AA, thanks to a split with Roseau and an earlier 6-0 shutout of Brainerd. But the Warriors (17-2-0) haven’t lost since that game way back on Dec. 19 and are riding high with a 13-game winning streak. Their best wins had been over Rochester Century (2-0), Bemidji (5-4), Alexandria (5-4), Sartell-St. Stephen (3-0) and Grand Rapids (4-2) – all quality programs but none currently considered among the best teams in the state. Even with that streak, the Warriors were still a bit overlooked by most hockey observers. No longer. 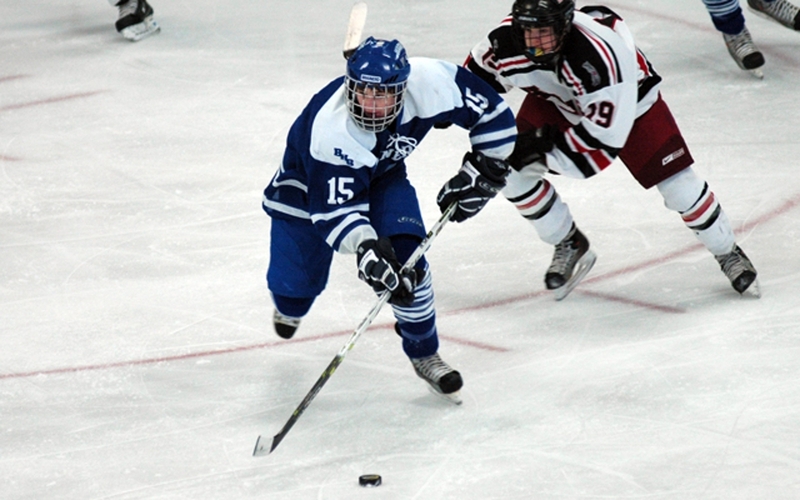 Brainerd forced its way into discussion for the top seed with its most recent game, a 3-2 victory over Roseau that likely knocked the Rams into the No. 3 seed. Roseau actually outshot the Warriors (38-23), but senior goalie Reid Mimmack stood tall with 36 saves. Mimmack (15-1-0, 1.67, .927) has been the backbone of the team since returning from football injuries that slowed the start of his season. A 6-foot-2, 195-pounder, Mimmack certainly stands tall between the pipes, but paired with his athleticism, makes him tough to beat. 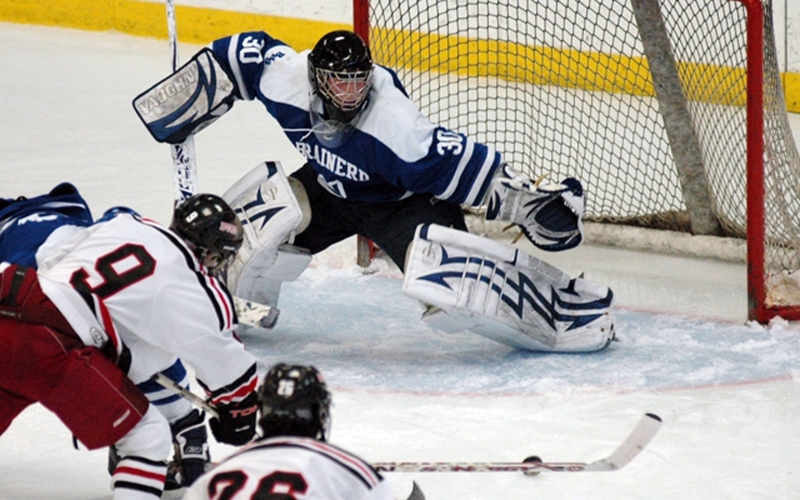 He’s won every game during Brainerd’s streak, including five shutouts. Mimmack gets plenty of help from his defense, which has limited teams to just 22.3 shots on goal per game and plays a hard-nosed, rugged, physical style that reflects their coach, former NHLer and Fighting Sioux legend Jim Archibald. Archibald provided plenty of offense at the University of North Dakota (75 goals and 69 assists for 144 points) while winning an NCAA title, but also is the school’s all-time leader in penalty minutes in a season (197) and career (540). His son, Josh Archibald (16-24-40) leads the Warriors in scoring and penalty minutes (46, tied with Brandon Wing) and appears a chip off the block. Brainerd gets plenty of firepower from its top two lines, which also includes Bret Jenkins (20-15-35) and Matt Pohlkamp (15-13-28). It’s been 14 years since someone other than Roseau or Moorhead represented Section 8AA at the state tournament (Alexandria in 1996), but Brainerd is certainly threatening to end that streak. A victory over Moorhead just might make the Warriors the favorite. Don’t expect the Spuds to roll over, though. Moorhead has already handed Brainerd one of its two losses with a 6-0 shutout back on Dec. 19. The Spuds scored three goals in both the second and third periods to earn the victory, while sophomore goaltender Michael Bitzer made 30 saves for the shutout. Moorhead’s record is deceiving, as the Spuds play arguably the toughest schedule in the state, losing to state-ranked Bloomington Jefferson and Wayzata twice each, as well as defeats to No. 1 Minnetonka and No. 8 Centennial. Bitzer (3-1-0, 1.98, .919) and senior Logan Marks (6-7-2, 3.23, .887) make a very good goaltending tandem for Moorhead coach Dave Morinville, who also likes the balance his team has shown on offense. The Spuds have no true superstars, but get scoring punch from all three lines. Brandon MacLeod (9-10-19) and Quin Buckellew (14-5-19) lead the team in scoring just ahead of Tyler Larson (7-11-18) and Braden Rahman (7-11-18), but nine different Spuds have at least nine points. One of the best rivalries in the state renews Tuesday night when Duluth East visits the Barn to take on the Lumberjacks. On paper East is a big favorite, but as any Greyhounds’ fan can tell you, that doesn’t assure a victory. East took a 7-0 decision back on Dec. 17 in the first meeting, outshooting Cloquet 40-16 and getting two goals from Nolan Meyer. But Cloquet has been playing better of late, just upsetting No. 3A Hermantown, 3-2, and would like nothing more than to do the same to the Greyhounds. Don’t be fooled by the Hilltoppers’ 10-10-1 record, as Marshall is a dangerous team that can make noise in Section 7A. Marshall played in three straight Class A state title games until falling in the Section 7A playoffs last year, while Virginia emerged from the Northeast as the section rep at state last winter and is the favorite to do so again. The Blue Devils’ Garrett Hendrickson (26-35-61) is one of the top scorers in the state and is committed to St. Cloud State. These two rivals staged a war in the Section 5A semifinals last winter and look to be on a collision course again. The No. 3A Hawks have as deep a defensive corps as anyone -- featuring Jeff Paczynski, Jared Kolquist, Conner Hady, Chad Bannor and Brian LeBlanc – and only allow 1.67 goals a game. Denfeld needs a signature victory to get momentum heading into the playoffs, as the Hunters are just 1-6-1 in their past eight games. They’re also very young at the top, as freshman lead the way in scoring (Levi Talarico with 14-19-33) and in nets (Zach Thompson with 9-5-2, 2.18, .926). Blaine is on a 12-game unbeaten streak (9-0-3) and look like the team to beat in Section 5AA again this winter. The Bengals have won the past four section titles and unless they stumble in their final three games against the Cougars, Maple Grove and Andover, will be the top seed again. One of those ties in the streak, however, came against Centennial back on Jan. 16, 4-4. That’s the only non-victory in eight games for the Cougars (7-0-1) who are also hot at the right time. This is the first of the top games of the week that doesn’t feature section opponents, but it does have arguably the two best teams in the Lake Conference (with apologies to Eagan and Burnsville). Eden Prairie has conference games in hand and is likely to win the title, but the Eagles are just 2-2-1 in their past five games, with losses to Burnsville and Eagan and a tie with Duluth East. Jefferson on the other hand, is rolling, with six straight victories. Their last loss, however? A 5-3 loss to Eden Prairie on Jan. 19 when super junior sniper Kyle Rau (35-27-62) had a goal and two assists. Two contenders, not only in the Big 9 race but in their respective sections, get together to decide who might be the best team in Southeast corner of the state. Faribault leads the Big 9 race and could get a No. 1 seed in Section 1A. The Falcons’ first-year coach, Brad Ryan, has previously been to the state tournament with Edina (2000), Orono (2006-07) and Blake (2008). Winona boasts of a high-scoring senior line with Jay Moran (22-32-54) and Aaron Theis (17-32-49) – both of whom have surpassed the Winhawks’ career scoring record – and Kyle Florin (29-11-40). Several of the highest scoring Class A players in the state toil in relative obscurity for these two Northwestern teams. The game was originally scheduled for Jan. 23, but was snowed out. In the first meeting on Dec. 15, the Lakers took a 5-4 decision with junior Tanner Lane (43-37-80) netting a hat trick and Alex Phelps (17-34-51) adding a goal and three assists. Those are the two snipers for the Lakers, along with Nate Baker (21-22-43), while Park Rapids counters with sophomore Sam Coburn (28-36-64) and senior Tucker Coburn (27-30-57), who also had a hat trick in the first game. Talk about precocious. Lakeville South has an all-underclassmen line of freshman Kyle Osterberg (13-32-45) and sophomores Justin Kloos (21-17-38) and Alex Harvey (18-15-33) that has the Cougars on the verge of getting the No. 1 seed in Section 1AA. South beat North in the battle of Lakeville back on Jan. 7, 4-0, with Brady Frahm earning the shutout with 24 saves. With the Suburban East Conference standings as tight as ever, just about any conference game this week could shake up the standings. Some of the biggies include White Bear Lake at Cretin-Derham Hall (7:30 pm, Thursday, Feb. 11) and White Bear Lake at Woodbury (7:30 pm, Saturday, Feb. 13). Heading into the week, the Royals are atop the standings with 24 points, but keeping pace are White Bear Lake (23), Forest Lake (22), Cretin (22) and Stillwater (18).